It is a real pleasure for me to revisit the Joseph Needham Research Institute and join you at this book donation ceremony. We are today gathered in the Institute founded by Dr. Needham and named after him. So, it is timely and fitting to recollect the exceptional life of Dr. Needham and in particular his extraordinary relationship with China. Dr. Needham was an outstanding biochemist, but he is best remembered as a great Sinologist and historian of science. His passion for China started in late 1930s. In the more than half a century that followed, he was devoted heart and soul to the research of history of science in China. His voluminous magnum opus, 'Science and Civilization in China' radically changed Western perception of China. In addition, Dr. Needham's scholarship made a far and deep influence on cultural exchanges between China and the West. His study of China is recognized as a masterpiece. 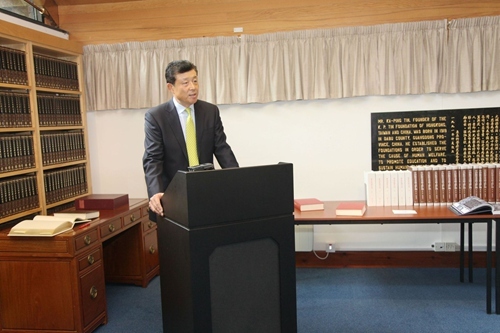 It also established his elevated academic status in the research of Chinese and world history of science. Dr Needham was not only an extraordinary scholar, but also a committed envoy of China-Britain friendship. From 1942 to 1946 in the war-torn China, Dr. Needham supervised the Sino-British Science Cooperation Office in Chongqing. Through this work he developed deep friendship with Chinese scientific communities. In 1950 he personally founded the British-China Friendship Association. In the absence of diplomatic relations between China and Britain, the association played a huge role in promoting China-Britain people-to-people exchanges. In 1965 Dr. Needham became the first president of the Society for Anglo-China Understanding. Through the Society, he worked tirelessly to present the British public a full and comprehensive view of China. Apart from his own academic attainments, Dr. Needham generated a wide interest in the history of oriental science in Britain and in the West at large. A landmark development was the founding of the Needham Research Institute. Today this Institute has become a world-class centre for the research of oriental and Chinese history of science. 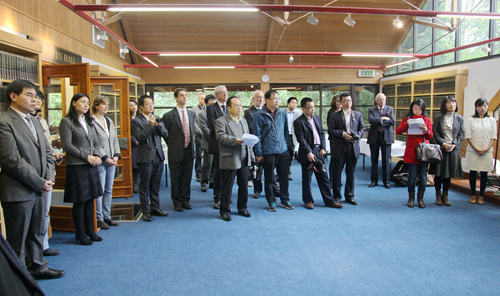 The Institute attracts a multitude of researchers from across the world and offers a unique asset for understanding China. Moreover, the library of the Needham Research Institute is of global importance, with a vast number of manuscripts, periodicals, and microfilms about China and a large quantity of traditional Chinese thread-bound books. No other collection of this kind exists outside of China. This means the library is a magnet for researchers of East Asian studies. Today, I represent the Chinese Ministry of Culture, the National Library of China and the Chinese Embassy. On their behalf, it is my great pleasure to donate to the Needham Research Institute about 200 books on Chinese culture and history, and a VIP permit for on-line access at the Chinese National Library. This donation has two aims. First, to enlarge the physical collection of the Institute's library. Second, to contribute to the digital development of the Needham Research Institute. Looking forward, I do hope these books and the on-line reading card will help the Institute make greater academic achievements. Dr. Needham's research focused on science in ancient China. We all agree that China in the past indisputably led the world in science and civilization. But, we should also realize that China today enjoys extraordinarily rapid economic growth and comprehensive social progress. The Chinese people are now striving to achieve the Chinese dream, a dream of bringing about prosperity of the country, renewal of the nation and happiness of the people. How to get a true and full picture, as well as a deep understanding of modern China? This is a pressing task and a daunting challenge for Britain, as well as for the rest of Western world. I hope that British and Western academic communities will not only examine ancient China, but more importantly, focus on what is happening in today's China. I hope your Institute will open new frontiers as well as build on the foundations created by Dr. Needham. I believe this would be the best way to make his legacy last and show our respect for him. We can always benefit through reflection about great figures in history. But, we are a new generation in a new era. We should strive to make our own breakthroughs and set new records. This is the only way to deepen understanding and friendship between Chinese and British people. This is the only path to strengthen exchanges and cooperation between China and Britain. This is the only route to scale new heights in science and make greater contributions to human civilization and advancement.